email campaigns that were brought to life each Xbox gamer's meaningful legacy. Reignite Xbox's waning social media channels. Gaming culture is all about gamer's achievements taking centre stage. A full carousel of options to inspire gamers to broadcast their adventures and share their experiences. 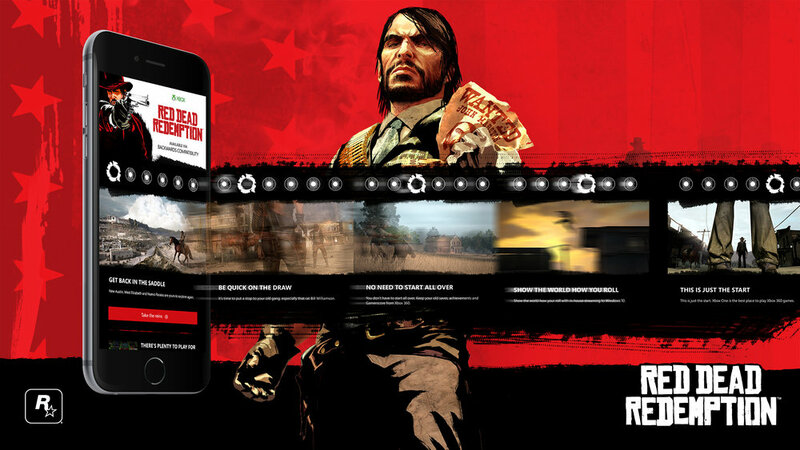 Migrate Xbox 360 users over to the new Xbox One using the launch of Red Dead Redemption on Backward Compatibility as a trigger. Such an iconic game, with such iconic moments deserves an iconic mechanism. WIth the innovative use a CSS3 carousel design, we create a quick fire 'six shooter' of nostaglic content. Take a poorly performing newsletter and transform it into an engaging piece of content. A monthly time capsule of your epic adventures, pulling in nostalgic and meaningful data that brings to life each game from your past, and how you can relive them on Xbox One.